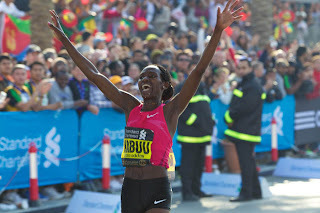 In the Olympics year the first surprise has the name of Lucy Kabuu, arrived in Dubai marathon a few days ago with the stunning debut of 2h19'34 ,the eighth fastest time ever in the marathon.Meet Lucy to his house a few days after the triumphant debut marathon in Nyeri in the Central region of Kenya.Lucy's first impression is of a very religious woman, "It tells us, to believe in God helps me so much and gives me the strength to tackle the hard work of training, in fact, my motto is" GOD IN EVERYTHING IS POSSIBLE". The technical part of this fast marathon runner has a lot of italian and she confirms it, "I competed in Italy in Modica in Sicily last September when I came third, a good race and a important experience for me.I am very near to your country why my coach is famous Renato Canova and my manager is Gianni DeMadonna, both a kind of family to me.I am very lucky because with my coach i have discovered a new way of training and you have seen results and my manager has created a training camp here in Kenya where he gives us what we need and this helps very much for a professional athlete. "The recent Dubai Marathon has given us a whole new dimension of Lucy "After two years away from racing for accidents and pregnancy, I came back to races last year doing very well in the Great North Run in September, where I finished in 1h07'06 on 21.097m and the marathon-project became reality.A end of November in New Delhi in India 67'04 "gave me the confidence to tackle the most delicate moments of preparation and I have to thank my coach for Canova everything it has done for me at that time. "DubaiMarathon the perfect race in our opinion and Lucy confirmes "I was sure of my condition and I really wanted a result of absolute prestige, the climate has helped me but I was perfect.It was a very linear race with only a problem by slowing the pace around 10k but quickly put on the pace of 3'17 km.My hard-psu around 38km was studied but Asefelech was good to be with me and the last kilometer she was more speedy.I am happy with my performance: recent training had been told that I was just fine and that a similar result should be the right conclusion. 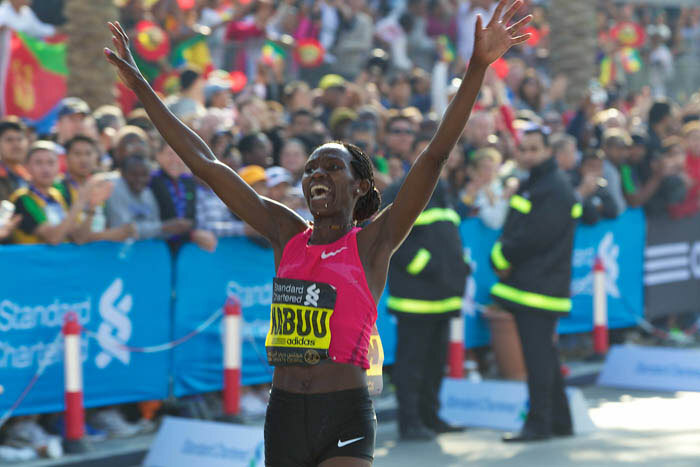 "The Olympic dream is still in the thoughts of Lucy Kabuu and she does not hide "It would be really cool to run in London in marathon and although I was not in the 6 pre-selected for my country, honestly i hope to be inside.After Dubai many say i must go to Olympics but i only hope to be there and wait for the final nomination at the end of April by my federation.